Following the recent completion of Australia’s 14-vessel Armidale Class Patrol Boat fleet, Austal announces the contract to build six 30 metre aluminium fast patrol craft for the Government of the Republic of Trinidad and Tobago. This significant order includes additional contracts for scheduled & unscheduled maintenance and crew training services and adds to Austal’s track record of providing capable and affordable defence solutions. The all-aluminium fast patrol boats will support the Trinidad and Tobago Coast Guard in providing sustained surveillance in the country’s internal waters, the archipelagic territorial sea and its exclusive economic zone. Each vessel will have a small 12 man crew, a maximum speed of 40 knots and will be armed with three General Purpose Machine Guns and a 20mm Cannon. All six vessels will be constructed at Austal’s facilities in Henderson, Western Australia and are scheduled for delivery by early 2010. During the construction period, Austal will provide a training programme including familiarisation of vessel operation, ship based engineer training as well as maintenance training for shore-based support personnel. 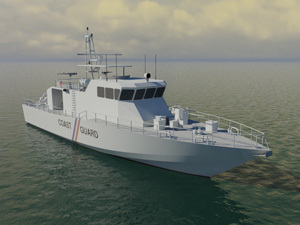 Following delivery of the vessels, a five year comprehensive maintenance and support services program will be provided by Austal, which will include scheduled planned and preventative maintenance support, unscheduled maintenance, management and performance of annual surveys and maintenance periods as well as shore-based engineering support. The contract, which was awarded following a competitive international tender process, followed similar naval fleets recently delivered by Austal to the Government of Kuwait, the Yemen Ministry of Defence, the Australian Customs Service and the New South Wales Water Police. “The added provision of a comprehensive five-year maintenance package and crew training services demonstrates the global support network of the Austal Service Department, which is now a growing business unit within the Austal Group,” he said. The fast patrol craft will play a major role in ensuring the safety of shipping, as well as the preservation of the marine environment. The vessels will also target the illegal trafficking of drugs, safety at sea and perform search and rescue duties. Each patrol boat is to be powered by two MTU 16 cylinder 2000 series diesel engines driving a Kamewa waterjet propulsion system, allowing a maximum speed of 40 knots and a maximum range of more than 1000 nautical miles at 10 knots.